September 30, 2017 8-4 p.m. Closing Mass: 5:00 p.m. to 6:00 p.m.
Friday, September 30, 2016 7-9 p.m. AND Saturday, October 1st, 2016 8-4 p.m.
"Called to Mission: One Heart-One Mind"
Saturday, October 3rd, 2015 8:00 a.m. to 5:00 p.m.
Sr. Ann Shields, S.G.L., is an internationally noted conference and retreat speaker and author of numerous books on Catholic spirituality including Deeper Conversion, To Be Like Jesus and More of the Holy Spirit (release date October 2013). She currently hosts the popular daily radio program Food for the Journey. She is a member of The Servants of God’s Love, a religious community established in the Diocese of Lansing, Michigan and is a member of the Diocesan Pastoral Council. 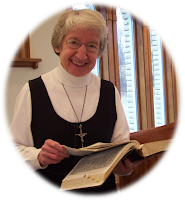 Sr. Ann was awarded the Benemerenti Medal by Pope Benedict XVI in September of 2012 for service to the Church and is a recipient of the Aggiornamento Award given by the Catholic Library Association in recognition of outstanding contribution for the renewal of parish and community life. 2013 Registration for the "Day of Reflection for Priests": Friday, September 27, 2013..........lunch and refreshments free. Registration for 2nd Annual SMOP Conference: Saturday, September 28, 2013 .........$40 includes lunch and refreshments. $45 -gluten free or lactose intolerance. Please note: No refunds as of September 1st, 2013. (613) 225-6067 10:00 a.m. to 9:00 p.m.
(2013) Please visit our booth at the Renewal Ministries "Lift Jesus Higher Rally" at the Metro Convention Centre in Toronto, Ontario on March 2, 2013. Invites ALL WOMEN to our 1st Annual Conference on AUTHENTIC FEMININITY AND SPIRITUAL MATERNITY FOR PRIESTS entitled "BECOMING A LIFE-GIVING WOMAN"
Saturday, September 29, 2012 8:00 to 4:30 p.m.